The first half of the high-level event on women in development depressed me. Heavy on platitudes and generalities, light on any real ideas. I also heard a lot of boring old tropes recycled – women don’t want to work outside the home, changing policy doesn’t help when culture is the problem. Things got much better in the afternoon. 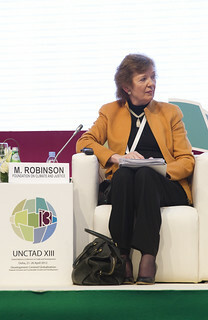 The incomparable Mary Robinson gave a firm and detailed talk on how we can start including women immediately and the panel discussion that followed. The overall consensus was that good policy has a significant impact on women’s inclusion into public life, and good policy runs the gamut from maternity leave to quotas for political participation. I met a woman who was so stunningly racist that I sat there listening to her, totally incredulous and spent the next hour processing that she’d really said all that. Among other things, she told me the problem with Arabs is that they have too much pride, the Middle East is barbaric and doomed, and that Arab civil society activists are cute. Speaking of civil society activities, I was on the bus with a bunch of them coming back from the conference venue. The buses run at random, so there’s a lot of waiting, so we all go to know each other. I am always surprised by how wealthy many civil society people are, although it makes sense when you consider it. You don’t have time to start or join an NGO if you’re struggling for money, and the kind of polish that gets you to international conferences is more often found in people with cash. Share the post "UNCTAD – Day Four"
I’m curious about the racist woman. Did anyone call her out on it? Was she well-received by the audience? It’s disappointing that people in development (especially people powerful enough to be on panels!) can still be so obtuse towards culture. She wasn’t on a panel. She just sat next to me briefly at an event. The things I quoted are stuff she said to me personally. And I didn’t call her out because I couldn’t really believe it was happening. I kept thinking I must have heard her wrong.